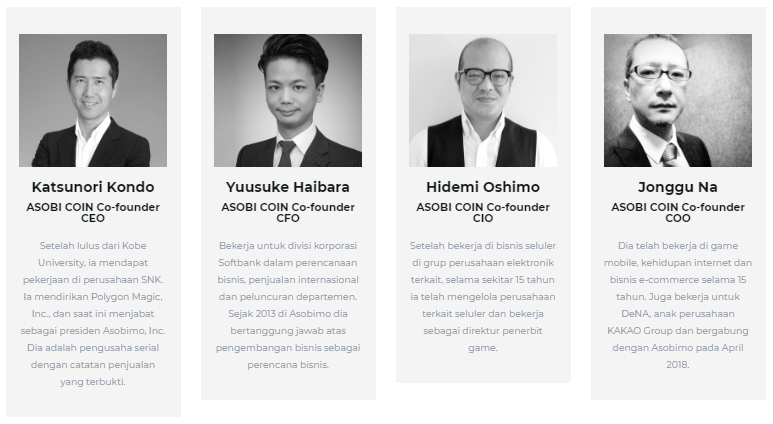 Hello my readers in the Blockchain and Cryptocurrency fields, today I want to introduce you to a project that is ASOBI COIN, ASOBIMO is a Japanese company that has more than 15 years of experience developing online games. More than 600 employees worldwide. ASOBIMO has also won a number of major awards, including the Google Play of the Year Award, the App Store Game Grand Prix. Digital content services currently do not give licenses to users, which makes it impossible to resell or when services are closed, users lose their content. Digital content is sometimes too easy to copy. How we allow content redistribution that works for users, content creators, and publishers. Trading digital content on distributed secondary markets. The new blockchain economic era for publishers and users. The Asobimo DApps platform will make digital content on the secondary market a valuable asset for all parties, and provide a safe trading experience with minimal costs and no friction. By using a smart contract on blockchain, ASOBI MARKET will automatically bring profits to the legitimate original content owner. What is the Asobimo Platform ? ASOBIMO is a platform for in-game items in ASOBI MARKET. Gamers can buy or sell virtual items in the game individually or through game publishers. Asobimo is also called DApps which provides a distributed secondary content platform with “Decentralized Security Systems” (DSS). blockchain that will provide evidence of ownership of undeniable content. With the Asobimo platform, exchange of safe, fair and modern market game items for all types of games and virtual goods. You will also be able to buy and sell digital content, such as comics, game items, and music that you want to share with others. Asobimo also plans to establish the first “Blockchain Game Association” with countries like China, Korea and Taiwan, to promote games and game items using blockchain technology. 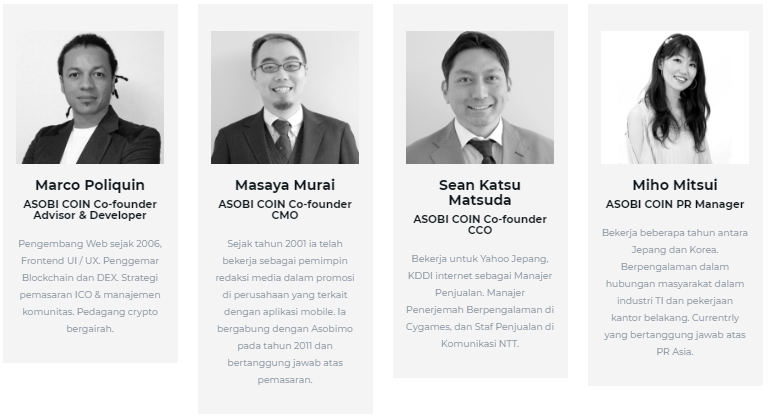 We aim to get more ASOBI COIN users by offering Airdrop for ASOBIMO game users. Our company game has millions of active users around the world. We will introduce the possibility to buy and sell game items in our store. You will be able to buy and sell digital content, such as comics, game items, and music that you want to share with others. We will provide a secure cloud system called “Decentralization of Security Systems” (DSS) using blockchain technology. We will create a P2P distributed secondary content platform. ASOBI MARKET bridges the gap between a centralized and decentralized world. Content and exchange purchases occur in a safe and trustworthy way on the Ethereum blockchain. DRM and streaming content occur outside the chain. We respect the freedom of users and the rights of publishers. Because users have complete control over their data on the blockchain, we can give them a feeling of true ownership. Publishers will enjoy enhanced market transparency and fair distribution of revenue sharing. Growing the next 1 million ASOBI MARKET users: Our company game has millions of active users around the world. We will introduce the possibility to buy and sell game items in our store. Airdrop: We aim to get more ASOBI COIN users by offering Air Drop for ASOBIMO game users. Building a Blockchain Game Association: Games go beyond the limits. We plan to form the first “Blockchain Game Association” with countries like China, Korea and Taiwan, to promote games and game items using blockchain technology. ASOBI COIN can be used in the game Asobimo following, as well as games from other companies. When you use ASOBI COIN in Asobimo game, 1 ASOBI COIN equals 2 JPY (about 0.02 USD). When the ABX value is $ 5, it’s equivalent to $ 10 in the $ 10 1ABX game the same as multiplying the value in the game. (50% discount compared to other stores) ABX Value Game users can buy game items 50% cheaper with ABX. We can expect gaming users to buy and use ABX.